I need an outfit for a formal dinner in August, but I want something I will wear more than once. Instead of a long formal, I think I can squeek by with a cocktail dress. 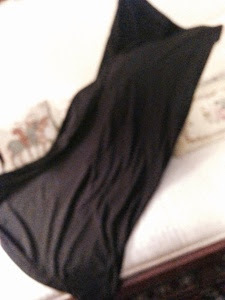 I ordered a little black dress from Nordstrom on-line, $150; uninspiring in person, I had to return it. Rather than mail it back, I returned it to the store here, where the Nordstrom sales person found me a cute little black dress for $895. Hmmm. No. I also needed a swimsuit, and, at Nordstrom, in the swim department, I noticed long black skirts with elastic waistbands being sold as "dresses/skirts" for around $50. Took me a second, but I realized they were designed to be pulled up and worn either as strapless bathing suit cover-ups or as skirts over a suit. Hummm. I remembered seeing something similar at Costco. These matti m skirts at Costco are very similar, but sell for $16.99. I'm not going to wear this to the formal dinner, I'm going to wear it over a swim suit. Probably.